Sunshine and outdoors! Summer is in full swing. We have been experiencing beautiful warm days — some warmer than others. But that’s the beauty of this season. Farmers markets are exploding with seasonal produce and an abundance of flower power. And local honey farms are showcasing their products with great pride. In fact, I recently attended a lecture about bee pollination at our local Whole Foods Market. It is amazing how these tiny bees create something so rewarding, one bit at a time. It definitely makes me respect every drop of honey I use. Especially at a time when there is quite a buzz about honey among health-conscious people like me who try to avoid refined sugars, and want to preserve this precious commodity. So I say, love our honey bees and respect their hard work. 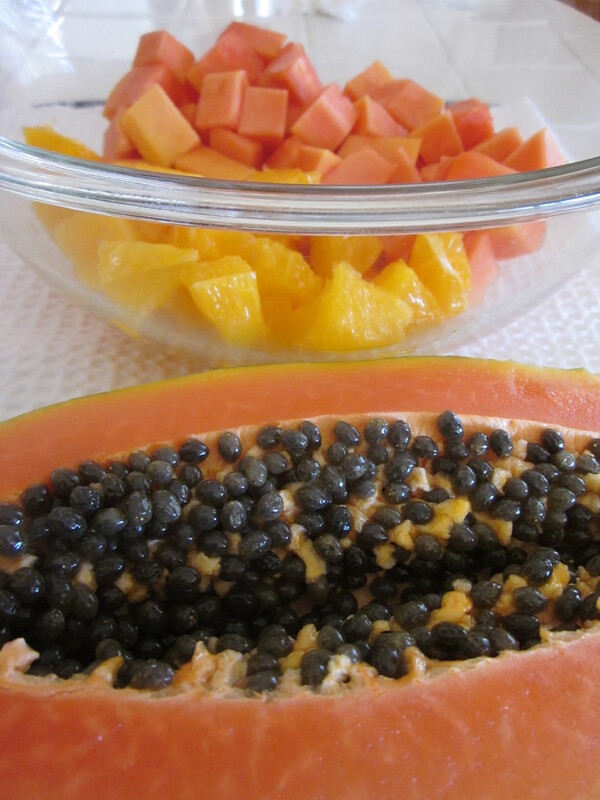 Papaya, known as an exotic fruit, is at its peak in summer even though it is available year round. I picked up one from my local farm stand a couple days ago. I love its buttery texture with sweet and musky taste. I usually eat it as is, but sometimes combine it with berries or banana to make a smoothie. Papaya salsa with sweet peppers and lime is another delicious option. 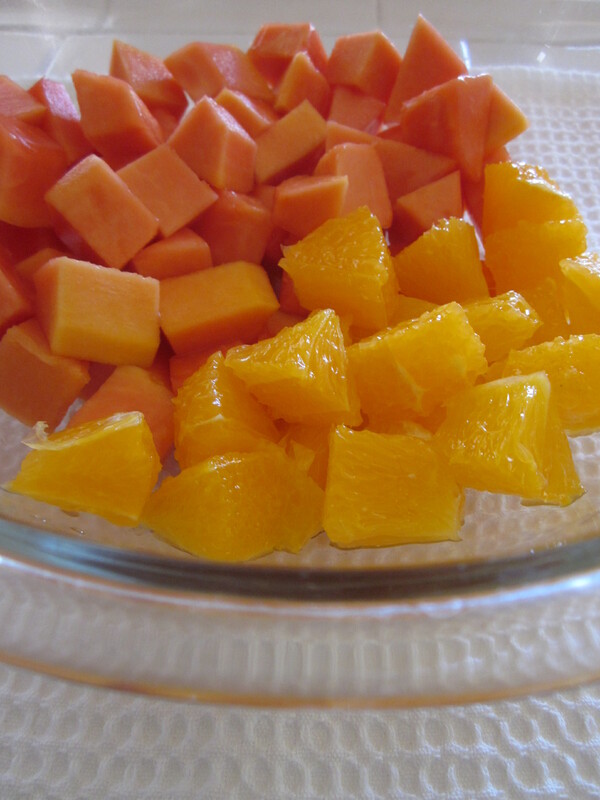 It can also be pureed with cantaloupe or any melon for cold soup. Unripe green papaya is used as a vegetable whereas ripe is eaten as a fruit. A lot of us don’t know that its black seeds are edible too. They have quite a peppery taste. 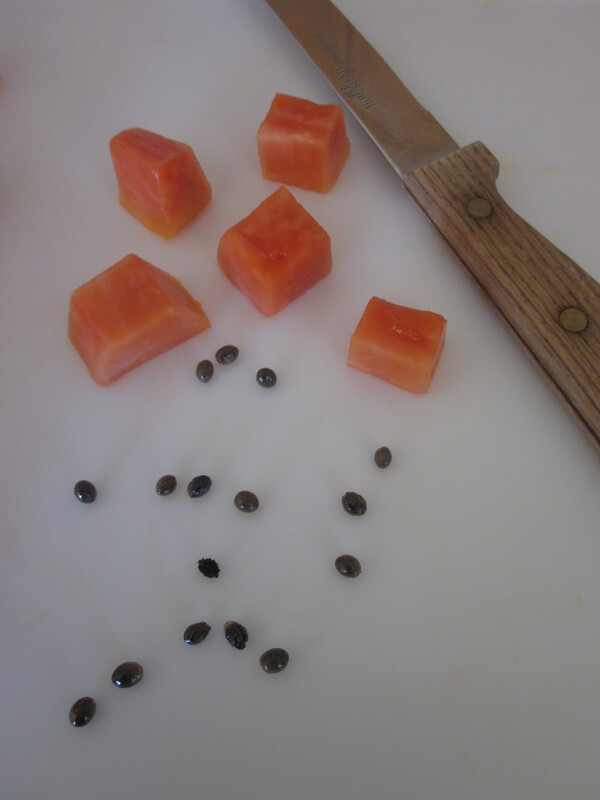 And several of papaya makes it a very desirable fruit. 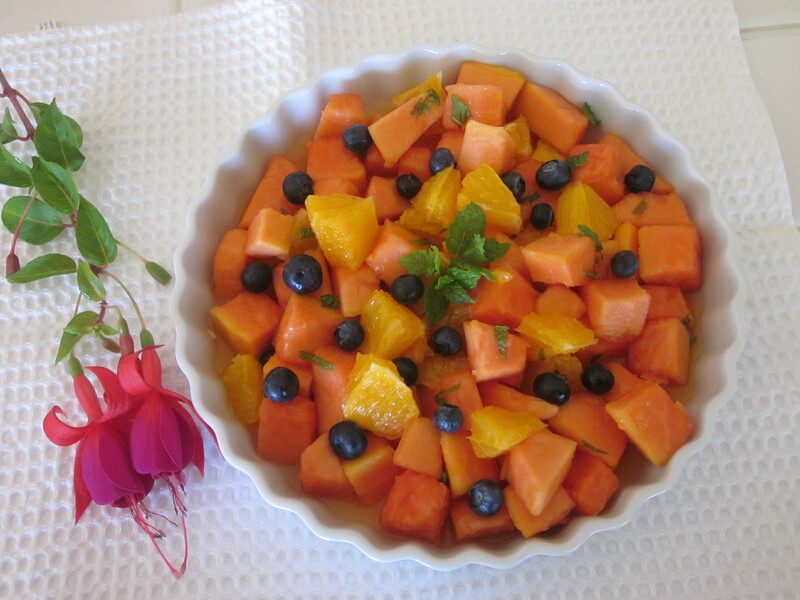 In a bowl, combine papaya, orange, blueberries, honey, and juice of ginger. Add red pepper flakes, if using. Mix gently. Transfer the fruits to a serving bowl. Sprinkle on sea salt. Garnish with remaining blueberries and mint. Serve immediately. 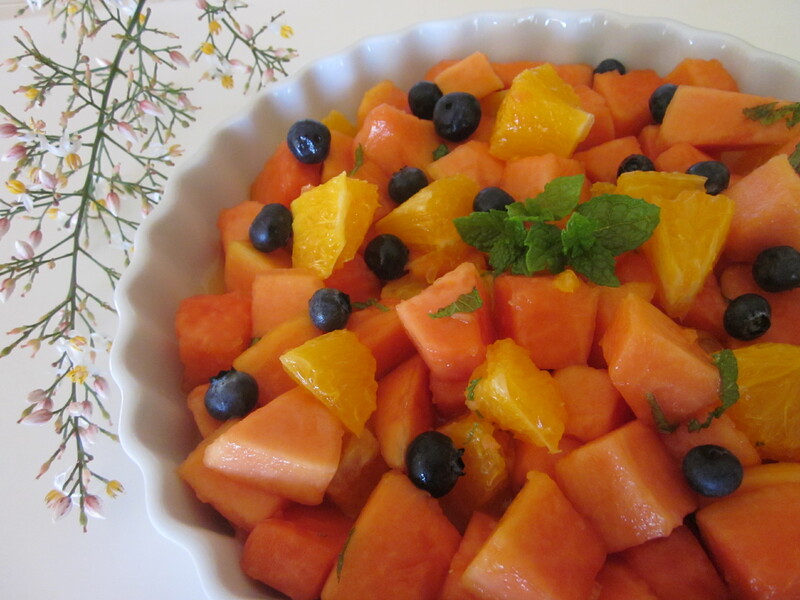 This fruit salad is a breeze to make. I combined summer fruits like papaya, orange, and blueberries with ginger juice and honey. I then added a pinch of red pepper flakes and a little sea salt to finish it. It’s a perfect combination of sweet and salty. Sweetness from honey with undertone of ginger and then a surprising salty bite makes this salad full of adventure. And the icing on the cake is the health benefits of this fruit bowl. No guilt here, even if you eat an entire bowl. All the ingredients are loaded with healthy nutrients. So fill up and savor summer’s bounty along with its sunshine. This salad is best eaten immediately.